A general Committee was apointed to work out the detailed scheme under the Chairmanship of Lord de Dunstanville. A month later the Committee was authorised to secure buildings to start a Central School in Fairmantle Street, Truro, and a subscription list was opened. By April 9th, 1812, the progress had been such that they were authorised to meet at Truro Town Hall on April 23rd to “admit children to the school.” A Mistress was appointed to teach the first four rules in arithmetic, writing, reading, sewing and knitting, her renumeration being £25 a year and a house free of rent and taxes. In Spetember 1813, the Committee’s report showed that 165 boys and 76 girls had been admitted to the school “to participate in the blessings of an education which had so liberally provided.” Masters had received instruction from schools at Gulval … Money had also been spent in assisting these schools to buy books, as well as boarding the masters whilst under training. The National School in Ludgvan was built in 1835. Prior to that an old Abcee school was held in the belfry at the base of the church tower. A minute was rrecorded in 1812 to install a stove in there for the benefit of the school room. This may have been the charity school mentioned above. Grace Lucille Boase (1809-1889) went to Penzance with her parents in 1811 and was educated, at Miss Penny’s, Miss Barnwell's, Miss Stone’s, and Miss John and Scott’s schools, Penzance. She writes “Miss Stone kept her school in the centre, and the one at the end [of Market Jew Street] belonged to the Daubuz family, who I think lived in Truro, but were often in Penzance … Lydia had been put to Miss Stone’s school as a boarder, Maria and Anne had been left in London at the Misses Babingtons school … My first schoolmistress was a Miss Penny who lived with an old father in one of the small houses which were pulled down to make an entrance to Mr. Robert Richards’ house, she was a very prim old lady who had been governess in her earlier days in some Bishop’s family on which she greatly prided herself, and loved to talk of their grandeur and glory. My next school was kept by two Miss Branwells, I think they must have been sisters of Charlotte Bronte’s mother, they lived in a small house on the South Parade where the Public [Morrab] Library was afterwards built. When the school became co-educational it was renamed The Bolitho School and is still going strong affiliated to, but independent of, the Woodard Foundation. At the time of the 1902 Education Act, this and the High School (both for Girls) were the only Secondary schools in Penzance. Closed in 1967. 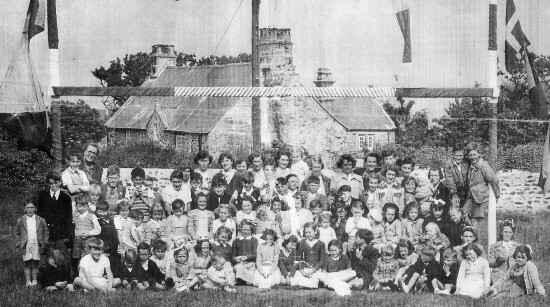 After the Penzance Church of England High School moved out of Clarence House in 1918, Miss B. M. Steadman opened a mixed Junior School there which opened in September. She named the school St. Erbyn having been assured by Mr. Jenner that he was a true Cornish saint. She also designed the brown uniform and the star badge. Among the staff were Miss E. M. Trezise (Trizzy) who was born in Pendeen and educated at the High School, and Miss Dorothy Hoare. The school grew until, by 1926, it had become a Boys Preparatory School with a dozen boarders and forty day boys. This became too much for the headmistress and she sold it to Reginald Frederick d’Argaville (Rex) Carr in 1927 who remained headmaster until 1970. Although born in Ireland of Irish parents, he lived almost all his life in Cornwall. His father was curate at St. Austell and worked at Redruth, Kea, Penryn and finally at St. Mary’s, Penzance. In 1932 he bought the freehold from Edward Bolitho and that inluded a games field. Soon after the school expanded to include No. 1 Clarence Place to accomodate the growing numbers and this allowed the out boarders to all be accomodated within the school. Girls were readmitted to the school in 1935 when Rex’s daughter Bridget joined. This is St. Ives Junior School, Ayr, in about 1950 sent to me by one of the pupils. Unfortunately the photo was torn but I have done my best to splice it together and clean it up. This was [?] the “Modern” School opened as a consequence of the 1944 Education Act. It closed as a separate school in 1980 to become part of the new Humphry Davy School. This was formed out of the Sixth Forms of the Boys‘ and Girls‘ Grammar Schools. A mixed comprehensive school, but I know nothing of its history. In 1939 [1941? ], Devonport High School for Boys was evacuated to Penzance, for a short time sharing premises with Penzance Girls’ Grammar School. It returned to its old location in 1945. Evacuated from the Seaford, Sussex from 1941–45 and located in Treloyhan manor, St. Ives, once the home of Sir Edward Hain and a hotel from 1930.